Walking along the coastal footpaths of the Ligurian Riviera offers striking views of lush Mediterranean vineyards, wild flower and olive groves; while inland there are dense pine and chestnut forests waiting to be discovered. The trip starts with a walk to the unique church of San Fruttuoso and the Jet-set seaside town of Portofino. Then travel by train to the picturesque villages of Bonassola and Monterosso, entering the magical land of the Cinque Terre, five unique fishing villages set like gems along the jagged high cliff coast line, that runs all the way to the colorful village of Portovenere where you can savor the delicious local cuisine and relax with a glass of white wine on a seaside café terrace. • Breath-taking views of the emerald blue Mediterranean Sea. Camogli on BB basis As soon as you get settled in your accommodation, step outside and breathe in the incredibly fresh, crisp air of the Mediterranean Sea. In the afternoon you can visit the historic centre, and in the evening, let all your senses be delighted as you prepare for your phenomenal walking adventure ahead. Camogli on BB basis Today’s walk starts in Camogli where you take one of the main paths of the Portofino Regional Park; a first steep section takes you to the village of San Rocco, then arrive to the San Fruttuoso Abbey. From San Fruttuoso, you can choose to walk or take a ferry to Portofino. Enjoy the wonderful view from Il Faro (the Light House), located at the extreme point of the promontory, 1km far from Portofino from where you take the train or boat back to Camogli. Bonassola on BB basis Today starts with a short train ride to Bonassola from where you start the walk through the hills of the East Riviera which divide Bonassola, Framura and Deiva Marina. The first part of this walk (Bonassola – Framura) is extremely panoramic with wonderful views over the northern Ligurian coast and it can be shortened by ending in Framura. Return to Bonassola by train. Monterosso on BB basis The first part of today’s walk runs along an old railway recently transformed in a flattish cycle path. You walk through tunnels and bridges with spectacular views over the sea and the cliffs till you arrive to the nice town of Levanto. Reach the ridge top to enjoy the spectacular views over the mountains which surrounding the gulf. Arrive in Punta Mesco and walk down towards the village of Monterosso where you overnight. Monterosso on BB basis A short transfer takes you to Soviore Monastery where you can stop for a visit before starting the walk back to Monterosso via Vernazza. From the Sanctuary you walk on asphalt road for 1,5km, then take a nice panoramic path that slightly descends to the Madonna di Reggio. Continue walking on a stone path down to Vernazza where you take the panoramic coastal path back to Monterosso. To shorten the walk, you can stop in Vernazza and take a train back to Monterosso. Monterosso on BB basis Take the chance to spend a day hanging around the Cinque Terre, enjoy the sun and the blue sea. As an alternative you can choose to walk one of the two itineraries described below. WALK A: Monterosso loop via Colle di Gritta Today you head inland past the ‘Chiesa dei Cappucini’ to Colla di Gritta. Continue over the graceful mountain ridge through stretches of lush forests, passing over Monte Molinelli, Monte Rossini, Montenegro and Colla dei Bagari until you reach Punta Mesco. Here you can opt for a short extension to the ruins of Sant' Antonio del Mesco. Return to Monterosso by descending a series of captivating old stone footpaths. The trail is steep and in some short parts has been ruined by rain so be careful with your footing. WALK B: Corniglia-Volastra-Riomaggiore A short train ride takes you to the village of Corniglia where the day’s itinerary starts. The first part of the walk (until WP 5) is quite steep, then you take the path to Volastra where the route becomes flat and very panoramic. The last section to Riomaggiore is on steep stairs. In Riomaggiore take a train back to Monterosso. Portovenere on BB basis A short train ride takes you to Riomaggiore from where you walk to the edge of mountain chain which border the Cinque Terre area. From Colle del Telegrafo, follow the edge till you reach Portovenere, passing through the Village of Campiglia. The day’s itinerary is spectacular thanks to the great views over the Cinque Terre coastline and the impressive cliffs of Portovenere at the end. Day 8 - Arrivederci Cinque Terre! The trip and our services end after breakfast. You can depart Monterosso by train and easily reach the Pisa, Genoa, Florence or Milan airports. 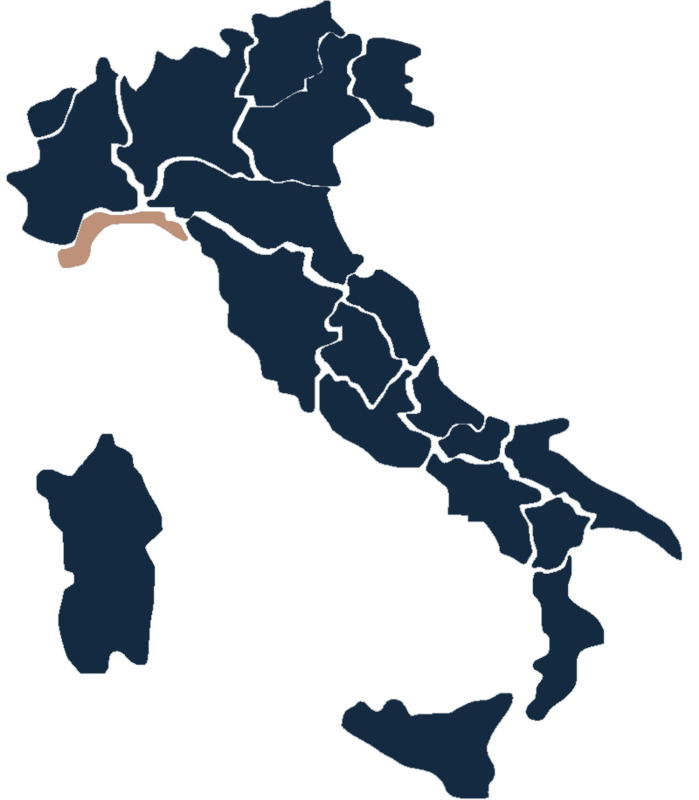 The nearest airports to the Cinque Terre are in Genoa and Pisa. Florence airport also has good connections. Nearly all trains from Genoa go directly to Camogli, just reach the several train stations in Genoa by AMT bus (Genoa bus company) from the airport (the whole journey takes approximately 1 hour). From Pisa airport take a train that you have to change at Pisa Centrale and again at La Spezia for a local train that stops in Camogli (approximately 2,30/ 3 hours). To leave Portovenere, just take a bus to reach La Spezia train station and then a train towards your destination. We use comfortable 2*, 3* and 4* hotels with a friendly family run atmosphere. In all the accommodation the rooms have private bathrooms and a good Italian breakfast is included each morning. The trip is on bed and breakfast basis because throughout the trip there are plenty of opportunities to taste both the outstanding local cuisine and a wide array of prestigious regional wines. The Cinque Terre can be very busy during certain periods of the year so both in Monterosso and Bonassola we work with several hotels of similar standard and characteristics. Due to this, all the walks start and end at a central point of the villages and you have to make your way to it from your hotel. This means that start or end of the routes are slightly altered. Therefore you should check to see if your accommodation is the same as that mentioned in this programme. If not, you must be alert at the start and end of the routes. In choosing alternative accommodation we have tried to maintain the same standards and quality. The walks are along well marked footpaths and mule tracks. It can be tiring walking along the stone steps of diverse sizes. Take the local train to get to and from the walks. The park wardens try to keep all of the paths open throughout the year, however heavy rains and summer fires can cause temporary closure of certain stretches, so be sure to check with the park office. Luggage transfer is included in your package from Monterosso to Portovenere. From Portofino to Monterosso you take your own luggage on the train. Self guided walking or cycling requires individuals to use problem solving skills, be adaptable and have a keen eye. It is recommended that you are comfortable map reading, referring to route notes and that you have a good sense of direction (or are willing to work on improving this!) Sometimes route finding, losing your way, finding it again and asking the locals for help is all part of the adventure. If you’ve never been on a self-guided trip, after the first couple of days you will get the hang of if as the vast majority of our first time travellers attest. Please be assured that our written material issued to you for route finding is updated regularly and we provide a 7day service hotline in the event of any problems. There is a certain level of the unknown that comes with self guided trips; however with a methodical approach potential problems will be averted. The freedom of a self guided trip is something that, once experienced, is sought time and time again. The concept behind most of our trips is active holidays and the fitter you are the more easily you will adjust and enjoy yourself. We expect participants to take responsibility for their fitness and preparations on a consistent basis prior to departure, and INCREASE the regular weekly training schedule in the two months leading up to departure. That way, when you start walking, you will feel relaxed and comfortable and strong, having done more than sufficient preparation for the trip. You will also have more energy to enjoy the views, take photos and explore the sights in your spare time, rather than just make it to the next hotel. During the day is when the most interesting features of interest will be found, and being fit allows you to optimize every situation you encounter. As a minimum, we recommend 40 minutes of aerobic type exercise; running, swimming, biking, hill walking, or gym work two to three times a week for two to six months leading up to your walk. Note the best training is the activity that you are actually going to be doing; walking up and down hill, and cross-country. Practice this as much as possible. Training should be stepped up as you get closer to departure, to an amount you feel appropriate (you don’t want to cause yourself an injury!). Using your gear before departure (boots, daypack, clothing, etc.) gives familiarity and comfort whilst on the walk. It makes sense to know that all your gear ‘works for you’ BEFORE departure, rather than discovering how things work or fit (or don’t!) on the trip you have invested so much in. Use the philosophy of ‘getting fit to go walking’, rather than ‘going on a walk to get fit’, to avoid problems. Trip Grade These walks, though not very long, are moderate to demanding because of the steep hills. Several walks can be shortened.